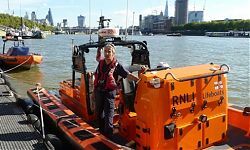 The Royal National Lifeboat Institution promotes itself as ‘The charity that saves lives at sea’. To which must be added ‘And on the Thames’, as our guide explained on a recent Museum of London ‘Friends’ visit to ‘Tower’ Lifeboat Station. 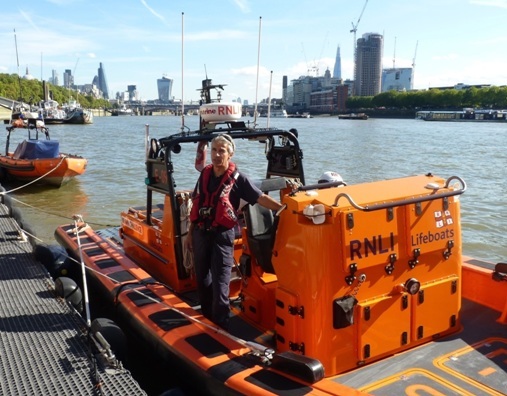 Before the RNLI came to the Thames, the rescue of those in danger on the water or foreshore was undertaken by the River Police, Fire Brigade, Port of London Authority launches, or whatever other craft were available, all of which were primarily designed for other duties. 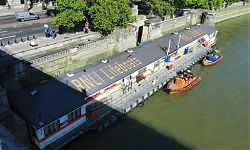 Following the Marchioness disaster of 1989 in which 51 people drowned, the RNLI were asked to take on the role of dedicated life savers on the Thames, which they have been doing since 2002. 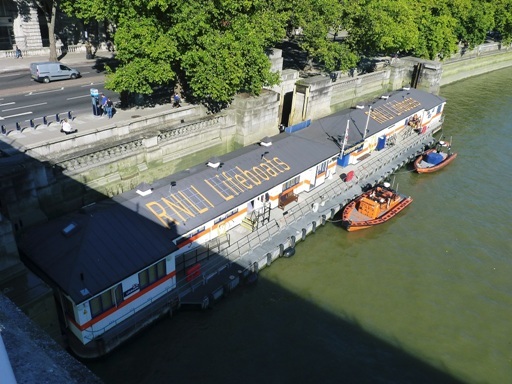 The RNLI now has four lifeboat stations on the Thames, at Gravesend, Chiswick, Teddington and the one I visited, originally based at Tower of London Pier, but now operating from a converted River Police floating pontoon in the shadow of Waterloo Bridge. ‘Tower’ Lifeboat Station is actually the busiest station in the RNLI network, with 501 launches, 105 people rescued and 14 lives saved in 2012. They often deal with small boats in difficulties, people taken ill or injured on all sorts of vessels, those who have accidentally fallen into the river or who are on a bridge parapet threating to jump. Falling on to the foreshore is especially hazardous, we were told, as the casualty will often have cuts or broken bones and be lying in an inaccessible place by the water’s edge. The important points to remember in case of a Thames emergency are to first call 999 and ask for the Coast Guard (Yes, really). Don’t go into the water after a person in difficulties, but try and watch where the current is carrying them. If you fall into the water yourself do not try to swim against the current, but make for something fixed to hang on to and SHOUT. And do not go on to an unfamiliar section of foreshore alone. 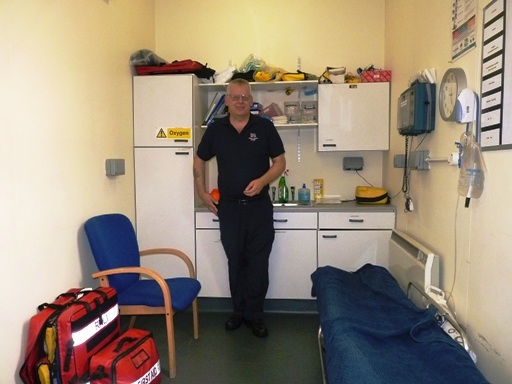 For more on Health & Safety on the foreshore, see here. ‘Tower’ Lifeboat Station has a number of unusual features because of its location and operating conditions. A duty crew is there 24/7, 365 days a year, but its total complement is 9 paid staff and 55 trained volunteers, who stay on the station for all of their 12 hour watch, so that their specially designed, waterjet powered E-Class Mark 2 lifeboat can be launched within 90 seconds of a ‘Shout’. This is a modified inshore rescue boat, very fast and manoeuvrable, with a shallow draught and a range of rescue equipment. The sides are low and there is a working platform at the stern, so that people can be pulled aboard easily, but this also means that the crew are very exposed, especially when racing somewhere at 45 knots with blue light flashing and siren going. 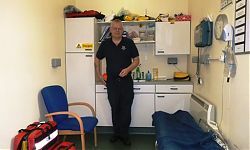 Although trained in first aid, the crews’ primary aim is to save life and then get the casualty to a better place for more sophisticated care, either in the medical room at the station, or by meeting an ambulance at a riverside location arranged by radio. 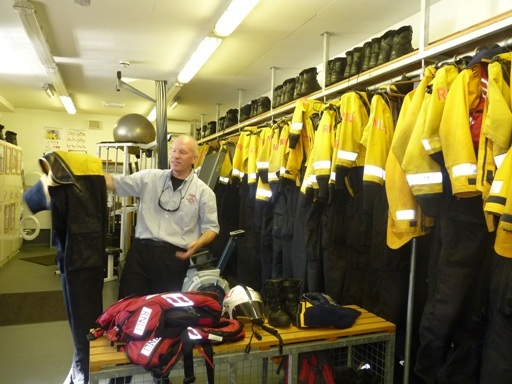 The crew themselves are equipped with a helmet with intercom connection, a dry suit to wear over clothes, a warm waterproof jacket, an inflatable life jacket and boots with Kevlar, which they find are better on the foreshore than the traditional RNLI wellie. This all costs. Lots. Over half a million pounds a year. So don’t be stingy when you see that collecting tin. We may all be in peril on the Thames, whether learning to row, exploring the foreshore or eating a dodgy crab sandwich on a tourist boat. 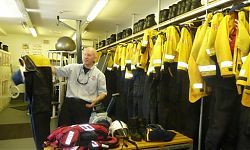 More details about Tower Lifeboat Station and video clips of some of their rescues can be found here.